For some months now, McLaren-Honda drivers Fernando Alonso and Jenson Button have pinpointed the Singapore Grand Prix as one of their best chances to score decent points this season. The beleaguered team's poor form in the last two races in Belgium and Italy resulted in a stormy news conference after qualifying in Monza, in which Honda F1 boss Yasuhisa Arai was given a severe grilling over his engine's lack of performance. Button, ever the politician, tried to put the situation into perspective. "In two weeks' time," he said, "we could go to a race and be fighting for fifth and sixth place and we probably wouldn't be having this conversation." So how can Alonso and Button be fighting for 15th and 16th places in Italy, but also hope to be half a field's worth of positions better off in Singapore next weekend? Let's look at the problems McLaren - and particularly Honda - have and try to explain. It is no secret that McLaren's biggest issue is the lack of competitiveness of the Honda engine, in the Japanese company's first season back in Formula 1 since 2008. Alonso laid the situation bare at the weekend, revealing information from the GPS speed traces used by teams to analyse how they compare to their rivals. "There are so many areas we need to improve," the two-time champion said, "but on a circuit that has six corners, on the GPS, we lose two or three tenths in those corners. The rest of the three seconds we need to find on the straights." To understand why this is so bad at high-speed Monza, but will have less of an effect on Singapore's streets, we need to explain the specifics of Honda's struggles with the turbo hybrid engine rules introduced into F1 in 2014. It's going to get a bit technical, but please bear with us - it's worth it. F1 engines are 1.6-litre V6 turbos with two separate but inter-linked hybrid elements recovering and redeploying energy that would otherwise be wasted. There is an electric motor linked to the rear axle - the MGU-K - which recovers kinetic energy during braking and stores it in a battery for use later. Power deployed from the battery via the "K" is limited to 120kw. There is a second electric motor - called the MGU-H (for heat) - which recovers energy from the turbocharger. The regulations do not impose a limit on how much energy is deployed to the wheels from this and so it can be considered as 'free' energy. Honda's fundamental problem is that it cannot harvest enough energy to deploy along the entire length of all but the shortest of straights. That means Alonso and Button run out of hybrid power - an immediate loss of at least 160bhp - part-way along the longest straights. Which explains why their rivals drive past them as if they are standing still in places such as Monza and Spa. This is much less of a problem in Singapore (or Hungary, for example, where Alonso finished fifth) because the straights are shorter - so the 'clipping point' as it is called might not be reached, or if it is, it will be only at the very end of the straights. Why is the Honda so short of energy? Honda has produced a very compact engine, part of a McLaren design philosophy to keep everything as small as possible for aerodynamic advantage. But this has led to compromises in the engine design. To keep the engine as small as possible, Honda built the turbo and MGU-H as one unit, and housed it together with the compressor, which feeds air into the turbo, within the vee of the engine cylinders. It is a similar philosophy to that used by standard-setters Mercedes. The difference is that Mercedes has a large compressor at the front of the engine joined to the turbo at the rear by an unusually long shaft, from which the MGU-H, sited in the vee, recovers its energy. The Mercedes design has a number of advantages, which we detailed in an article last year. Honda has a more compact layout - to fit the compressor inside the cylinder bank, it needed to be made much smaller than Mercedes', so it lacks efficiency. Its maximum revs are also limited. Because of its location, Honda cannot enlarge it without changing the design of the engine - and to do that, it needs more engine 'tokens' under F1's complex system of development restrictions than it has available this year. Is Honda's hybrid system the engine's only problem? Beyond the hybrid system's shortcomings, Honda's internal combustion engine (ICE) is also lacking compared to the best units from Mercedes and Ferrari. By how much, however, not all agree. Mercedes is said to have a significant advantage, just on the ICE, of 10-15bhp over Ferrari and as much as 50-70bhp over Renault. Arai has said he believes Honda's ICE is in the region of 20-25bhp more powerful than Renault's. Other engineers say that the two are very close, that Honda was perhaps marginally ahead before an upgrade in July moved Renault back in front by about 25bhp. Adding the 700bhp Mercedes is reputed to develop from its ICE, to the regulated 160bhp of MGU-K power and the extra 'free' electrical energy from the MGU-H of as much as 30-40bhp, gives a total Mercedes power output in the region of 890-900bhp. Renault's and Ferrari's hybrid systems are believed to be competitive with Mercedes, which puts them at about 830-840bhp (Renault) and 880-890bhp (Ferrari). McLaren's problems become clear when all this information is applied to the Honda engine. It is in the region of 60-80bhp down on ICE power alone - in addition to a significant shortfall of MGU-H power, and the loss of all hybrid power (160bhp from the K plus whatever its H produces) at a given point on the straights. Can Honda fix its problems for 2016? Honda has plans to work for the remainder of this year on both the performance of the internal combustion engine and the efficiency of the hybrid system. But, because the problem is so fundamental, any improvement will be limited and it will be next year before a significant step forward can be expected. The big question is whether Honda can redesign its engine for next season to enable a turbo-compressor-MGU-H layout of the required efficiency. "That is the objective of the development," says Arai. "We know the compressor is the biggest issue we are trying to solve. I know how difficult it was at Silverstone, Spa and Monza and how much we need to get that working. "We know looking at the data what other cars are deploying and how much. So obviously the minimum objective is there." Sources close to McLaren have questioned Honda's sense of urgency in dealing with the problem and whether it fully grasps the size of its deficit; whether they are right to do so will only begin to become clear next season. In Singapore, Honda's deployment shortfall is likely to be an issue only on the longest straight between Turns Five and Seven, and perhaps not even there. But if McLaren were losing 0.2-0.3 seconds a lap through the six corners of Monza, that margin will clearly increase proportionally through Singapore's 23. Engineers rate the McLaren as about the fourth or fifth best chassis in F1 - behind Mercedes, Red Bull and Toro Rosso, in the region of a Ferrari. But that's not to say McLaren do not have car problems. The MP4-30 has more drag compared to the best cars but less downforce, and it struggles for traction out of corners. In recent years, McLaren have suffered for pursuing a policy of chasing maximum rather than usable downforce. The problem this tends to create is that while the car is theoretically faster, judging by its maximum downforce levels, the drivers cannot access all this performance out on the track. That's because the more heavily worked airflow is more sensitive to being disrupted - which leads to a sudden loss of grip, and therefore drivers' confidence. The most successful cars tend to be ones that pursue what is called 'friendly' downforce - a lower theoretical maximum, but more downforce accessible to the driver more of the time, because the aerodynamic platform of the car is stable. This second philosophy is how Red Bull operated through their years of success, and how Mercedes also do now. McLaren said at the start of the year that they would also adopt this approach, having realised what they were doing wrong. But insiders say that since it became clear that the chassis lacked overall downforce, the team have reverted to the bad old ways, chasing theoretical numbers rather than practical performance. This is almost certainly why the car is run with very stiff suspension compared to the likes of Red Bull and Mercedes - if the aero platform is inherently unstable, you want to control the pitch of the car as much as possible, to try to reduce the instances when the airflow 'stalls' and downforce is lost. It is also notable that McLaren have still not caught up with the latest front wing philosophy, as pioneered by Mercedes and successfully followed with a mid-season upgrade by Red Bull. This year's car layout was conceived around the compact Honda engine layout before McLaren's chief engineer Peter Prodromou joined from Red Bull last autumn. Honda is designing a larger compressor and revised turbo and MGU-H into an engine that will retain the same fundamental architecture, with the aim of keeping the package as compact as possible. Prodromou, meanwhile, is working on eradicating the flaws in the McLaren car design, focusing on the frontal aerodynamics and creating the strong airflows around the car into the area around the rear wheels and floor that are so critical to performance - and where Red Bull have traditionally excelled. 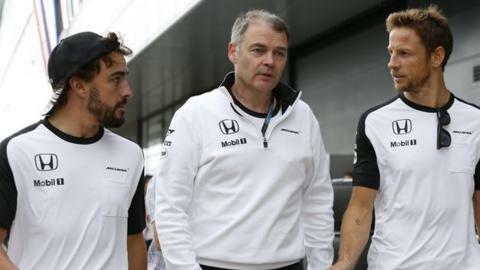 Although McLaren and Honda bosses are sticking to their mantra of "one team" in public, whispers of internal tensions are beginning to emerge. In the circumstances - McLaren's worst season in 35 years - this is hardly surprising. McLaren and Honda are so deep in the mire that they have looked in danger of drowning at times. But if any improvement in results in 2015 will be more dependent on circuit layout than anything else, there is the impression that team and engine manufacturer have at least some idea of what they need to do for 2016 to start hauling themselves back to where they are expected to be.